Human cytomegalovirus (HCMV) is a member of herpesviruses family and a neurotropic virus. The long-term goal is to investigate the neuropathy induced by HCMV, so as to gain insight into neuropathogenesis and develop better therapeutics and diagnosis. Congenital HCMV infection is the most common infection cause of birth defects (neurological disorders), infecting 1% of newborns each year. Clinical data suggests that the main target cell in the fetal brain is the neural progenitor/stem cell (NPC). Accordingly, we established a HCMV productive infection NPCs model to investigate the mechanism for perturbation of NPC proliferation and differentiation induced by HCMV. For long-term study, we have constructed a stem cell bank, a platform for basic research and source for clinical trial and application. We found that NPCs are fully permissive for HCMV infection and shed high level of infectious virus, the gestational age doesn't affect the permissiveness; HCMV infection alters the cell fate, and down regulates NPC markers, especially SOX2 and Notch signal pathway molecules. Further study showed that viral components of IE1 and pp71 were involved in these dysregulation. Additionally, cellular factors, such as miRNA-21, targets viral (HCMV-UL26) and cellular (CDC25a) genes and thus regulates HCMV infection. In the other hand, as neurotropic viruses, herpesviruses can be modified to label neural circuitry. The advantages of these viruses include 1) high capacity for gene deliver, 2) close to species of primate, 3) stable DNA viruses. We have successfully modified HCMV, MCMV, VZV, HSV and SVV; primary data have shown that these viruses can be potential viral tool for high efficient, direction defined, sparse, specific neural circuitry labeling. Min-Hua Luo, M.D. 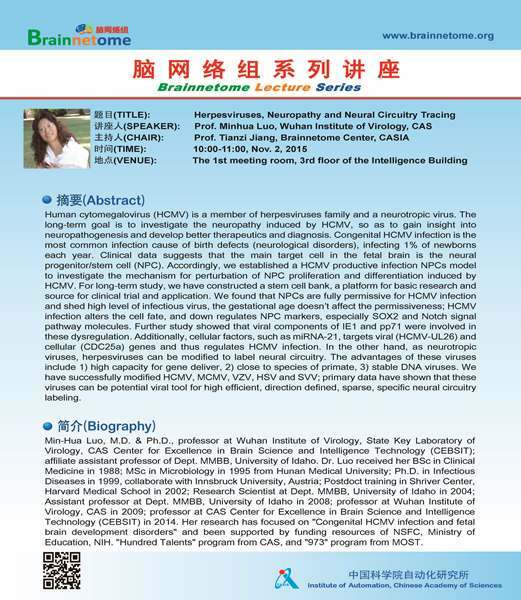 & Ph.D., professor at Wuhan Institute of Virology, State Key Laboratory of Virology, CAS Center for Excellence in Brain Science and Intelligence Technology (CEBSIT); affiliate assistant professor of Dept. MMBB, University of Idaho. Dr. Luo received her BSc in Clinical Medicine in 1988; MSc in Microbiology in 1995 from Hunan Medical University; Ph.D. in Infectious Diseases in 1999, collaborate with Innsbruck University, Austria; Postdoct training in Shriver Center, Harvard Medical School in 2002; Research Scientist at Dept. MMBB, University of Idaho in 2004; Assistant professor at Dept. MMBB, University of Idaho in 2008; professor at Wuhan Institute of Virology, CAS in 2009; professor at CAS Center for Excellence in Brain Science and Intelligence Technology (CEBSIT) in 2014. Her research has focused on "Congenital HCMV infection and fetal brain development disorders" and been supported by funding resources of NSFC, Ministry of Education, NIH. "Hundred Talents" program from CAS, and "973" program from MOST.